Echinacea is a group of wildflowers on which Americans spend more than $300 million a year for its ability to treat the common cold. Several species of echinacea are used, the most common of which are E. purpurea, E. pallida and E. angustifolia. Proponents claim that echinacea stimulates the immune system and prevents and treats upper respiratory tract infections and, sometimes, lower urinary tract infections. It is also used topically to enhance wound healing and treat eczema, psoriasis and other skin conditions. American Indians used echinacea for a variety of ailments. It was introduced into medical practice in the United States in the 1880s as a treatment for common colds and other infections, before there were sulfa drugs. It has been known by common names such American cone flower, black susans, Kansas snakeroot, purple cone flower and Indian head. Now, its popularity is largely confined to the United States and Europe. In Germany, it is frequently prescribed by physicians. How does echinacea stimulate the immune system? Studies suggest that it stimulates cells in the body whose primary function is to fight invading particles and organisms. White blood cells and spleen cells increase in number when echinacea is taken. Core body temperature rises. These effects seem to be due to no single compound in the plant. There are a number of complex substances, called phenolic compounds, in echinacea that seem to work in combination to produce these immune enhancing effects. Components of the root, leaves and flowers all contain the immune-stimulating compounds. As is the problem with most scientific studies on herbals, well-designed, double-blind, placebo-controlled studies are few. The studies that find a reduction in symptoms with echinacea are usually done on a small number of subjects. The majority use either an extract of the cold-pressed liquid of the above-ground portions of E. purpurea in an alcohol base, or the alcoholic root extract of E. angustifoliae or E. pallidae. Unfortunately, these preparations are not commonly available. The form in which echinacea is usually sold is the pill or tablet form. The amount of echinacea's active compounds in a pill or tablet varies from brand to brand. An article on herbal remedies in the March 1999 issue of Consumer Reports entitled "Herbal Rx: The promises and pitfalls" conducted an analysis of a dozen brands of echinacea. The study found that the brands American Fare-Vita-Smart, One-A-Day Cold Season and Sunsource Echinex contained the highest percentage of phenolic compounds, the active components of echinacea. However, they also found that even within a brand, pills in different bottles had different percentages. When Should I Take Echinacea? It is recommended that it be taken from the onset of viral symptoms until 48 hours after the symptoms disappear. It should not be taken habitually as a preventative measure. When you are well and free of infections, taking echinacea over stimulates the immune system unnecessarily, depleting its capabilities. This results in immune system suppression, which leads to greater risk of illness. It is therefore recommended not to take echinacea for longer than eight weeks. For most people who take echinacea over the short term, the herb is relatively safe and non-toxic. However, some may experience allergic reactions. Individuals who may be allergic to echinacea include those with a history of asthma or rhinitis and allergy to members of the daisy family. In these cases, echinacea is best avoided. Echinacea should not be taken by people with auto-immune diseases, including lupus, multiple sclerosis and collagen disorders. This is due to the nonspecific stimulatory effect that echinacea has on the immune system; it can worsen symptoms of the disease. Individuals with tuberculosis or who are HIV-positive should also avoid taking the herb, because their decreased immune capabilities may be more rapidly depleted with over stimulation. Additionally, persons on immunosuppressive drugs like corticosteroids or cyclosporin, are cautioned against the use of echinacea. Corticosteroids and cyclosporin are drugs commonly used after organ transplants and with lupus. Using echinacea with immunosuppressive drugs counters their effect, possibly resulting in severe illness. 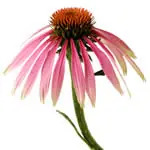 Long-term use of echinacea has been associated with toxicity to the liver. Hence, it should never be taken with other drugs that are also toxic to the liver, such as anabolic steroids, amiodarone, methotrexate or ketoconazole. This area of drug-herb reaction is not completely understood; therefore, the best approaches are to avoid habitual use of echinacea and to discuss its use thoroughly with one's physician. In conclusion, otherwise healthy individuals may use echinacea for the treatment of colds on a short-term basis. It is a relatively safe herb whose use is already widespread in Europe and the United States. If you decide to try it, first review whether you have any of the allergies or conditions indicated above, or take any medications that echinacea may interfere with. If not, inform your physician that you plan to try echinacea. Next, purchase a well-known brand from a reputable retailer. Use the dosage suggested on the label. Try to use echinacea for no longer than a week, and only if you have the symptoms of a cold. If possible, document your results. Did taking echinacea reduce the duration of your cold? Did it reduce the symptoms? If so, it may be working for you. If it has no positive effect, stop taking it, and seek conventional means of treatment.